We are back from our preview sailing on Celebrity Edge. 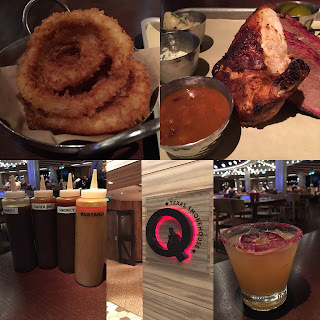 Hopefully, you were following our adventure on Twitter, Facebook, and Instagram during that time, but if not, don't worry, as we finally have some time to summarize our experiences here as well. The Celebrity Edge lived up to all the hype prior to its arrival in Fort Lauderdale. 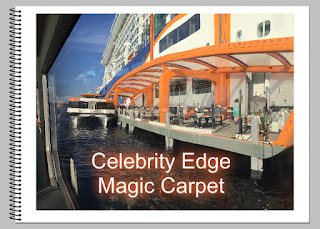 Celebrity Cruises has really knocked it out of the park. We didn't mind waiting 6 years for a new class of ship, if this was the result. Follow along for complete details. If you have any questions, reach out to us via any of our social accounts. I'm not a big fan of all the mobile apps that are in use these days. I almost need a second phone just for apps. However, I did find the new Celebrity Cruises App very easy to use and helpful. So I recommend you install it in advance. Once you've signed into your Celebrity Cruises account on the app, you can select your upcoming cruise vacation and all the information you need for planning is now at your fingertips on your phone or other mobile device. Have you ever come back from a cruise, taken a look at the paper daily planners, and said "I wish that I knew that was going on, I would have done that?" Well, now, you can do your planning in advance and be sure to have your list of "to do" events on your phone. Of course, you can always change your mind or just "go with the flow" - that's what cruising is all about. But for the planners, this is definitely ideal. Here's a quick video from Celebrity Cruises that demonstrates the new app's functionality. The app worked seamlessly for me, but my husband did need to do a reinstall during the cruise when it seemed to get hung up, but all was fine after that. Celebrity Cruises recommends using the phone app to check in for your cruise, but you can also do so online on their website. We like to have all bases covered, so we had the boarding passes on our mobile phones, and also a printed copy (in case you have network issues at the pier for some reason). 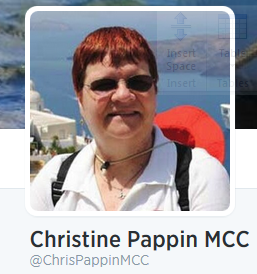 We did use the mobile boarding pass on the day of embarkation, along with our passports. The weather in Southeast Asia in January is gorgeous compared to the cold and snowy winter back home. The Caribbean isn't the only place you can escape the weather. We encourage you to expand your cruise vacation destination list to beyond the Caribbean. It's hard to believe that Thanksgiving is here already. Where did 2018 go? As has become my tradition, I'd like to share with you some of the things that I'm thankful for and highlight some of my adventures this year. I hope that you, your family, and friends have plenty to be thankful for this holiday season. I know that I have plenty of things to be thankful for, including my health, family, and friends and the ability to share my love of cruising with all of you. I’m grateful that I’ve been able to explore new worlds with family and friends again this year. The cruise industry is strong as ever with new ships and added capacity helping to keep prices reasonable for those that plan ahead. The value of cruising has never been stronger. Even in these tough times, more and more families have taken to the seas. Indications are that the record discounts offered the past two years will be coming to an end. In the meantime those discounts have made cruising an even better value, and consequently we have seen a surge in first-time cruisers. Cruises Inc., Cruise One, and Dream Vacations will hold the 2018 National Conference on Norwegian Bliss which just started its inaugural season. We sailed out of Los Angeles for the Mexican Riviera, but were diverted to San Francisco, San Diego, and Ensenada due to Hurricane Willa. We enjoyed experiencing this amazing new ship. It was the largest ship to ever dock in San Diego, so there was quite a lot of excitement in the port area from locals. We wonder what the Pilgrims, who came to the New World in Tall Ships, would think about the Norwegian Bliss. Their ships measured 110 feet, held 150 passengers at most, and took months to cross the Atlantic. The Bliss is about 10 times that length (1082 feet), holds 4990 passengers (double occupancy) and 1750 crew, and took just a couple weeks to cross the Atlantic. We will be sailing a preview cruise on Celebrity Edge this weekend - this is the most anticipated new ship for 2018. Be sure to follow us on our social media for live images. Thank you for making our blog column a part of your lives in 2018. I hope that the information we share helps you to dream about future cruises of your own. I'd be honored to help you plan those trips. I have the best job in the world - helping make dreams come true. For that, I'm truly thankful. As the sun rose on Ft. Lauderdale, Florida this morning, November 19, 2018, Celebrity EDGE, the most anticipated ship of this year, arrived to Port Everglades. Our General Manager, Drew Daly, and Barbara Julian, from Celebrity Cruises, were on the jeti capturing some of the first images as she made her way into port. The traditional fire boat salute escorted the ship into port. 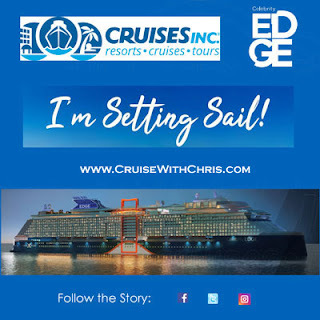 We have the privilege of sailing on Celebrity Edge next week, along with fellow travel professionals and press. Follow us on our social media, and here, for an inside look at this brand new ship. This is the first ship to be designed in 3D. She is much more than a ship, she is truly a work of art. Celebrity EDGE arrives in Fort Lauderdale, Florida the week of November 19th after crossing the Atlantic Ocean from its birthplace in France. It was built by Chantiers de l'Atlantique (STX France) in Saint-Nazaire, France. 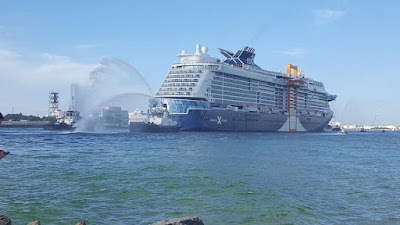 It was delivered to Celebrity Cruises on October 31, 2018 after four years of planning and a 23 month construction period. The 2,900-guest ship is the first of four ships in the new EDGE-class. The 1,004-foot-long vessel’s unique features include the Magic Carpet, a large multi-use elevator of sorts that moves up and down the side of the 16-deck ship while playing the role of mass transportation, but also as an entertainment and dining venue. Another unique feature on Edge is the three-story venue called Eden that will feature an 18-foot-tall wall of plants over a bar that uses ingredients from the plants in its drinks. The venue will act as relaxing lounge during the day and dinner theater venue at night with aerialists and musicians. We will be onboard Celebrity Edge for one of the initial pre-inaugural sailings in November and will be bringing you live images via our social media accounts. Be sure to follow us on Facebook, Twitter, and Instagram for all the action.